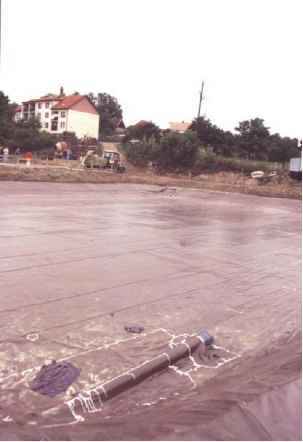 Kickuth's concept was closer to the traditional understanding of a soil treatment of sewage but his statement that root and rhizome growth would improve hydraulic conductivity of heavy soils failed on several early construction sites and it gave a harsh setback to the scientific and official acknowledgment of HF CWs as sewage treatment systems. The problem in constructed beds where soil is used as medium is the low hydraulic conductivity which results in surface flow and thereby a short retention time within the system. HSSF CWs were introduced to Denmark in 1983 and then to the United Kingdom in 1985. The operational experience from more than 100 HSSF systems in these two countries resulted in the use of coarse materials such as gravel or crushed rock with fraction in the range of 5-20 mm (Figure 5). where Ah = surface flow of bed (m2), = average flow (m d- ) Cin = influent BOD5 (mgl- ), Cout = effluent BOD5 (mgl-1), and KBoD = rate constant (md-1). N (0.033 md^1) and total P (0.025md_1). In North America, for size calculations, background values of individual pollutants are often used (see Constructed Wetlands, Surface Flow). 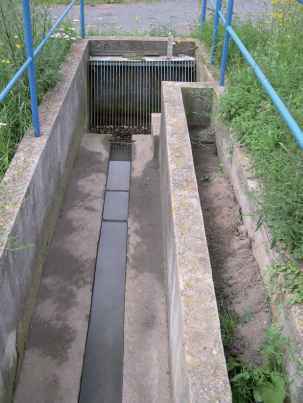 is usually divided into several beds in order to provide better access for maintenance and better wastewater distribution (see Figure 2). On the other hand, this approach requires more land. For example, CW for tertiary treatment of 24435 PE in Beja, Portugal, consists of 32 beds with a total area of 22 800 m . Examples of various bed configurations are given in Figure 6. The aspect ratio (length:width) also changed during years. While the early systems used to have long and narrow trenches with aspect ratio (length:width) >1, aspect ratio is usually <1, at present. Wide inlet zone prevents overloading but on the other hand it is more difficult to maintain an even distribution across the inlet zone. The depth of vegetated beds with HSSF was initially based on the requirement that roots and rhizomes of the vegetation should penetrate the full depth of the bed in order to eliminate totally anaerobic zones. As the roots of the most frequently used plant, common reed (P. australis), are capable to successfully penetrate to the depth of about 0.6 m and start to weaken beyond that point, the recommended bed depth was 0.6 m. Roots and rhizomes of reeds and all other wetland plants are hollow and contain air-filled channels that are connected to the atmosphere for the purpose of transporting oxygen to the root system. The majority of this oxygen is used by the roots and rhizomes themselves for respiration, but as the roots are not completely gas-tight, some oxygen is lost to the rhizosphere Although it has been proven that oxygen transported from aboveground organs diffuses only to the thin substrate layer adjacent to the roots and rhizomes the typical arrangement of HSSF CW has the depth of filtration bed usually 0.6-0.8 m. According to the working principle of HSSF CWs, the amount of oxygen released from roots and rhizomes should be sufficient to meet the demand for aerobic degradation of oxygen-consuming substances in the wastewater as well as for nitrification ofthe ammonia. However, many studies have shown that the oxygen release from roots ofdifferent macrophytes is far less than the amount needed for aerobic degradation of the oxygen-consuming substances delivered with sewage. A wide variety of materials is used as a substrate for HSSF CWs. The early systems used cohesive soils with high clay content. However, the low hydraulic conductivity of such materials resulted in clogging problems. Since the late 1980s, materials with high hydraulic conductivity have been used, namely gravel (pea, cobble) or crushed rock (Figure 7) with the size fractions in the range of 5-20 mm. It is recommended to use one fraction and do not mix several fractions together as this may result in uneven homogeneity of the filtration material. The coarse material provides high treatment effect, does not clog, and supports good plant growth. It is also recommended to use washed materials because this removes fines which could block the void spaces. systems have used a plastic liner or membranes such as HDPE, LDPE, or PVC 0.5-2 mm thick (Figure 8). Where local subsoil has low hydraulic conductivity (approx. 10~8ms_1 or less), it is not necessary to use plastic liners. In order to prevent liner damage by filtration material particles geotextiles are commonly used to cover plastic liner. Also, geotextiles could be also used beneath the liner. range of 50-200 mm. The large stones are necessary for good water distribution across the inlet zone. Figure 15 Flexible hoses for water-level contro| at HSSF CWs Figure 17 Phragmites australis (Common reed). Photo by Cista, Czech Republic. Photo by J. Vymazal. j. Vymazal. (Figure 16). This arrangement provides very fine and easy control of water level. The water level is usually maintained 5-15 cm below the bed surface. The macrophytes growing in CWs have several properties in relation to the treatment processes that make them an essential component of the design. The most important effects of the macrophytes in HSSF CWs in relation to wastewater treatment processes are the physical effects the plant tissues give rise to, such as insulation of the bed surface during the winter or provision of surface area for attached microorganisms in the filtration bed. The metabolism of the macrophytes (plant uptake, oxygen release) are of minor importance in HSSF CWs. 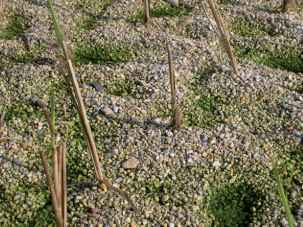 The macrophytes have other site-specific valuable functions, such as providing a suitable habitat for wildlife, and giving systems an esthetic appearance. It has been shown that in temperate and cold climate regions, probably the most important role of plants is to insulate the bed during winter. 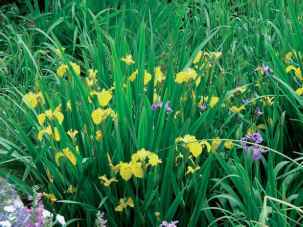 Therefore, it is desirable to use fast-growing species which also have a high aboveground as well as belowground biomass. The macrophytes for HSSF CWs should also be tolerant of a relatively high organic load in the wastewater. (Taro), Phalaris arundinacea, Iris versicolor (Northern blue flag), Saggitaria latifolia (Duck potato), or Scirpus fluviatilis (River bulrush). In Africa, Cyperus papryrus (Papyrus) and P. mauritianus are most frequently used for HSSF CWs. Plant stock that are frequently used to establish CWs for wastewater treatment include seeds, bare-root seedlings, rhizomes, greenhouse-grown potted plants, and field-harvested plants. It seems that bare-root seedlings are the best option and plant stands establish very soon; also rhizomes provide good results. Potted plants are not too suitable for HSSF CWs as the soil cloud will be washed out to the deeper layers and fill void spaces. Also, potted plants are not easy to transport as compared to bare-root plants of rhizomes. 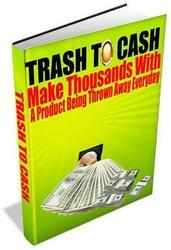 The use of field-harvested plants is usually cheap but very often introduces many weeds. 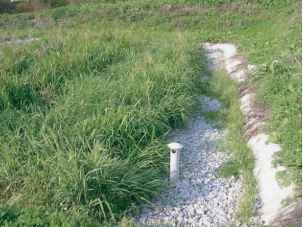 Weeds (plants that were not intentionally planted) occur mostly within vegetated bed margins. The most frequently occurring species are those that tolerate pollution and wet conditions as well, for example, Rumex obtusifolius (bitter dock), Urtica dioica (slimsting nettle), or Atriplex patula (fat-hen saltweed). If high-quality seedlings are used, planting is made carefully in a sufficient density (4-8 seedlings perm2) and in proper time of the year; weedy species are completely overgrown and their scatter growth is limited to margins. Plants in HSSF CWs are usually not harvested and the litter is left on the surface. However, plants could be harvested but it has been shown that plant harvesting removed only negligible amount of nutrients from wastewater. 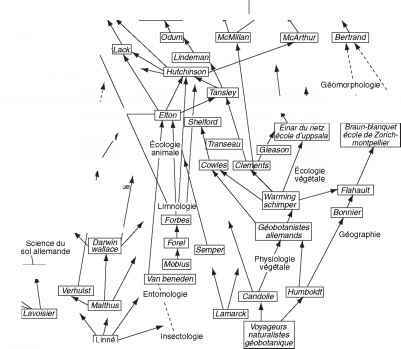 Also, if plants are harvested the systems look more esthetic as compared to systems which are not harvested. In developing countries the biomass is always used for manufacturing various products as mats, fences, roofs, etc. Aerobic degradation of soluble organic matter is governed by the aerobic heterotrophic bacteria. However, dissolved oxygen supply is very limited in HSSF CWs and, therefore, anoxic and anaerobic processes usually prevail. Anaerobic respiration occurs in the soil zone below the Fe3+ reduction zone and the process can be carried out by either facultative or obligate anaerobes. It represents one of the major ways in which high-molecular-weight carbohydrates are broken down to low-molecular-weight organic compounds, usually as dissolved organic carbon, which are, in turn, available to microbes. Anaerobic degradation is a multistep process. In the first step the primary end-products of fermentation are fatty acids such as acetic, butyric, and lactic acids, alcohols, and the gases CO2 and H2. Strictly anaerobic sulfate-reducing bacteria and methane-forming bacteria then utilize the end-products of fermentation and, in fact, depend on the complex community of fermentative bacteria to supply substrate for their metabolic activities. Suspended solids that are not removed in a pretreat-ment system are effectively removed by filtration and settlement. Most of the suspended solids are filtered out and settled within the first few meters beyond the inlet zone. The accumulation oftrapped solids is a major threat for good performance of HSSF systems as the solids may clog the bed. Therefore, the effective pretreatment is necessary for HSSF systems. The major removal mechanism of nitrogen in HSSF CWs is nitrification/denitrification. Field measurements have shown that the oxygenation of the rhizosphere of HSSF CWs is insufficient and, therefore, incomplete nitrification (i.e., oxidation of ammonia to nitrate) is the major cause oflimited nitrogen removal. In general, nitrification which is performed by strictly aerobic bacteria is mostly restricted to areas adjacent to roots and rhizomes where oxygen leaks to the filtration media. On the other hand, prevailing anoxic and anaerobic conditions offer suitable conditions for denitrification but the supply of nitrate is limited as the major portion of nitrogen in sewage is in the form of ammonia. Volatilization, adsorption, and plant uptake play much less important role in nitrogen removal in HSSF CWs. Volatilization is not effective as there is no free water surface and adsorption is greatly limited by the fact that filtration media (gravel, rock) do not provide suitable sorption sites. Plant harvesting contributes to an overall nitrogen removal only marginally (usually <10% of the inflow load) with N standing aboveground stocks in the range 20-60 gN m~2. Phosphorus is removed primarily by ligand exchange reactions, where phosphate displaces water or hydroxyls from the surface of Fe and Al hydrous oxides. However, media used for HSF wetlands (e.g., pea gravel, crushed stones) usually do not contain great quantities of Fe, Al, or Ca and therefore, removal ofphosphorus is generally low. Removal ofphosphorus could be enhanced by the use of filtration media with high sorption capacity such as calcite or light-weight clay aggregates (Leca). In such cases, however, the sorption capacity is always saturable and therefore, the media must be replaced in order to maintain high P removal. Removal via harvesting accounts usually for <5% of the inflow load with the P standing stock in the aboveground biomass in the range of 3-10gPgm~2. Harvesting may play a more significant role in nutrient removal in lightly loaded tertiary treatment systems. 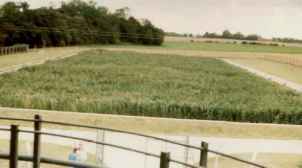 The removal of microbiological pollution is very seldom the primary target for constructed treatment wetlands. However, wetlands are known to act as excellent biofilters through a complex of physical, chemical, and biological factors which all participate in the reduction of the number of bacteria of anthropogenic origin. Physical factors include mechanical filtration and sedimentation; chemical factors include oxidation, UV radiation, exposure to biocides excreted by some plants and adsorption to organic matter. Biological removal factors include antibiosis, predation by nematodes, protozoa, and zooplankton, attack by lytic bacteria and viruses and natural die-off. HSSF CWs are very effective in removing organics (BOD5, COD), suspended solids, and microbial pollution (Tables 1 and 2). Removal of nutrients is lower but it is important to realize that most HSSF CWs have been designed with organics and suspended solids as primary target and therefore, the dimensioning is not sufficient for removal of nutrients (see section titled 'Vegetated beds'). However, the results in Table 1 present only the results of vegetated beds. When overall treatment effect is evaluated it is necessary to include also the treatment effect of pretreatment units. For nutrients, it usually does not represent any substantial removal but removal of suspended solids, BOD5, and COD in pretreatment units usually amounts to 40-60%, 30-50%, and 20-40%, respectively, as compared to raw wastewater inflow. 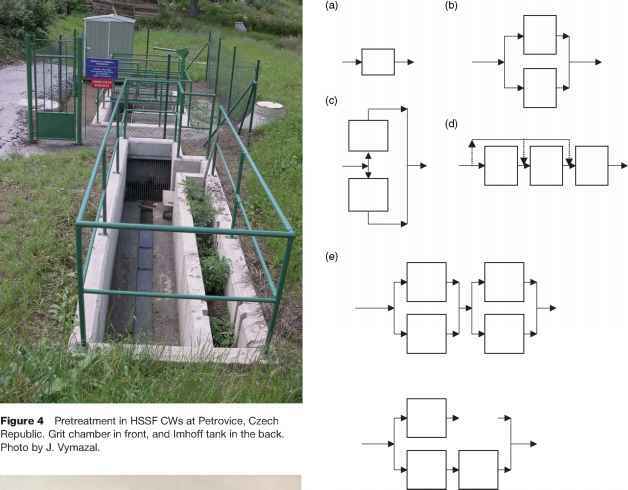 From Vymazal J (2005) Constructed wetlands with horizontal subsurface flow and hybrid systems for wastewater treatment. Ecological Engineering 25: 478-490.
aInflow for BOD5, COD, and TSS is expressed in kg ha"1 day"1 and for TP, TN, NH^-N, and NO"-N in gm"2yr"\ bOutflow for BOD5, COD, and TSS is expressed in kg ha"1 day"1 and for TP, TN, NH|-N, and NO"-N in gm"2yr"\ For details see Table 1.
built to treat municipal or domestic sewage. However, recently the HSSF CWs have been used for many other types of wastewater including those from agriculture, industry (Figure 21), or landfill leachate (Figure 22).